It’s always nice to have useful bathroom accessories and linen, and one of the best things you can have is a stock of decent bath sheets. In this informative article, we bring you some of the best bath sheets in the market. Before we proceed, let’s be clear about the difference between bath sheets and bath towels. A bath towel is one that can vary in size, although a popular size is 28″ X 55″. A bath sheet, however, is much larger maybe as big as 35” X 60” which can cover the whole body. Bath sheets are typically used by ladies while they do their hair or apply makeup after having a bath although they are used equally by both men and women. In this article, we bring you our top pick which is the Utopia Cotton Bath Sheet chosen for some cool features that we will discuss at length, but we have included a couple of others that are also good, to give you a more extensive range of choices. Fabric Composition: For other clothing items, a mix of synthetic materials may seem OK and even desirable, but towels should always be made of 100% cotton as that is what will make them most absorbent and soft. Ply Explanation: The number of stands that are combined to make a single thread is known as ply. You can get single-ply, two-ply or three-ply towels. Three-ply towels are the most durable. Lint Factor: Lint is the fluffy residue that some fabrics leave after being washed in a machine. This occurrence can be a nuisance, as it sticks to the other clothes as well. Although lint filters usually resolve this issue, you may find it better to use a bath sheet that produces less lint, in the first place. Material: All of the picks here on this page are made of 100% cotton. However, bamboo has become more popular and is being used more often now for bath sheets and towels. The durable yet soft fabric is winning over more loyal fans, including new moms who are buying bamboo baby washcloths due to their soft texture. We’ve discussed the bamboo vs. cotton towel debate here. 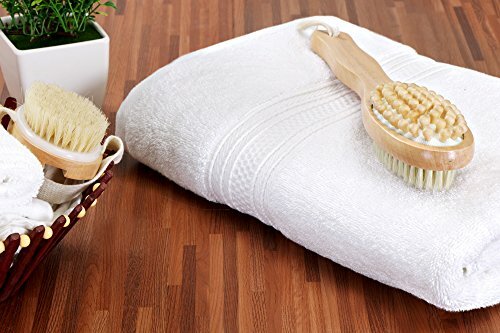 If you haven’t tried bamboo and are interested…we’ve also researched some top picks for bamboo bath sheets here as well as bamboo bath towels in case you are also looking to complement your large bath sheets. At 40” X 80” this bath sheet is massive and will cover all sizes of people with ease. You will feel a pleasant, luxurious after-bath euphoria with the Salbakos Turkish Bath Sheet. These are made of 100% Turkish cotton. There is a wide range of colors to chose from and the colors are VAT dyed which means that the colors will not run on washing and the bath sheets will not fade after repeated washing. The materials used for manufacturing this bath sheet are free from pesticides and harmful chemicals. Made in Turkey (known for quality towels), this soft, durable towel is produced devoid of any bleaching process, even for the white sheets – those are manufactured using white dye. The winning features on this product are its size and rich texture of the bath sheets. One fault is that it may be lacking some feel and absorbency compared to other sheets on the market. It’s also possible you’ll find a high accumulation of lint in the washing machine the first few times you wash them, although this is a relatively common problem with many new towels and bath sheets. As you can see, 700 GSM is quite a good number for a bath sheet. Although slightly smaller than the other bath sheets described here, this one makes up in absorbency and versatility which is what we look for in a bath sheet. This product is 100% cotton with 2-ply yarn and is highly durable in that it does not deteriorate after multiple washes. There is a considerable lint accumulation initially, but in all fairness, the manufactured has mentioned this as a disclaimer, recommending a separate wash for the first time. The Utopia Bath Sheet is also free from synthetic and harmful chemicals. You will find this product useful at a spa, gym, beach, poolside or just to lounge about at home after a nice, hot bath. A wide range of colors is available from which to choose. This bath sheet scores high marks for absorbency. Another plus is that the bath sheets get even softer after a few washes. However, as with other thicker, quality towels on the market, there seems to be a considerable accumulation of lint in the first few washes. This bath sheet is manufactured in Turkey or India, the authentic source countries for quality cotton. It is made from 100% cotton and 2-ply yarn. This plush bath sheet is highly absorbent and is Oeko-Tex certified, which is an international stamp of approval that ensures that the product meets high safety and environmental standards. 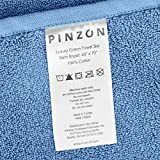 The Pinzon Luxury Bath Sheet is made from 2-ply yarn. At 820 GSM weighing 1.8 lbs, it has a high density yet is easy to wash and dry. The dimensions of the bath sheet are 70” X 40” which provides a luxurious cover, guaranteed to give you a comfortable and relaxed after-bath feeling. It is also washing machine-friendly and can be safely used in a dryer as well. Most customers who used the bath sheet were quite satisfied. The most positive features of this bath sheet are the size, density, and absorbency. However, the bath sheets may became a bit too rough after repeating washing. As we mentioned earlier, of all the three products mentioned here, we have selected the Utopia Cotton Bath Sheet as the top pick. A bath sheet should be big, absorbent and durable. This product meets all those requirements. It also fits the GSM requirements, tests of durability and has no harmful chemical substances added. Last but not least, you will agree that this bath sheet is the most reasonably-priced, which is an important consideration when you are shopping for accessories for your home. So, with these factors in mind as well as a large number of positive customer reviews, we feel that the Utopia Cotton Bath Sheet is indeed the best pick. We hope you have enjoyed reading this review. Please feel free to post your valuable feedback, comments, and questions if any and we will be happy to respond.